Hair color is part art and part science. Our technology gives us the ability to bring the two together in a way never seen before. Some call it the future of hair color, we call it Polly Chrome. So this technology we speak of—how do we do it? We wish we could say it’s simple, but it actually took years of research, expert development, and fine-tuning. Like most hair color companies, we start with the the basics, aka the color wheel. It informs how we use “harmonious color schemes,” “pure color,” and things like shade, tone, and tint to lay down the groundwork for our color formula. 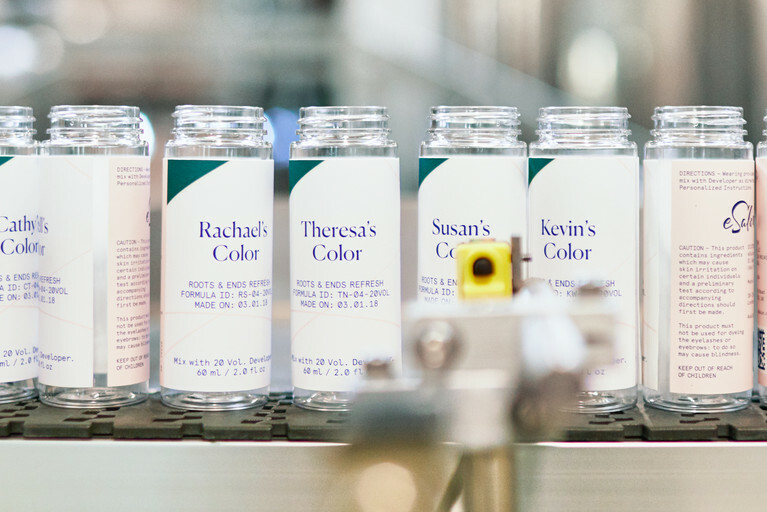 But we’re not the kind of company that settles for “what’s always worked.” We wanted to make it even better, so we took a step into the future by customizing each hair color bottle we create. And that’s where the science and technology comes in. To pull this off, we built two totally unique components that together disrupt the whole hair color industry. First, we created dual patented software that enables us to create unique color formula IDs. Then something else comes into play. The star of the show. The tour de force. Our do-it-all, label-making, color-dispensing, bottle-capping, watch-out-world machine—Polly Chrome. You know the drill: you tell us about your hair history and color goal, then we run with it to craft your custom shade. We do it by using our Color Editor, which is able to tweak your color with a level of customization unseen in the industry. Think of it this way, your colorist is the artist and the Color Editor is their paint brush. But instead of hand-mixing dye and eyeballing tones, our colorists are trained to create color virtually. How? Our engineers and coders turned color into a language. Shade variations and pigments become characters and symbols that makeup your color formula ID. Using the Color Editor, your colorist references your photo and the info in your Color Profile to determine your base color. Then, they can formulate less that ¼ shade difference in things like “tone,”“warmth,” or “vibrancy,” all while factoring in your hair history and grays. It’s how they meet your exact specifications, to make your color completely unique to you. 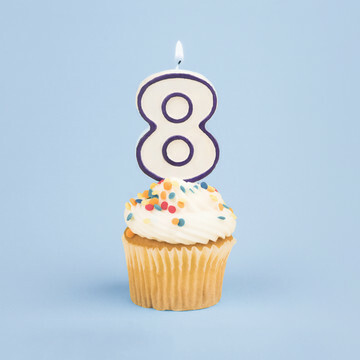 So how does your custom color go from numbers to, well, hair color? Here’s where it gets really good. We built a mixing machine named Polly Chrome, which means “many colors.” Polly speaks our language. Ok, so it doesn’t literally speak (we’re working on it) but it does communicate with our Color Editor by taking your formula ID and putting it into action. Here’s how it works: First, your personal colorist creates your formula ID using our Color Editor then hits “send.” It passes over to Polly, who prints that formula ID, your name, and the date on a label. That label gets placed onto an empty color bottle and travels down a conveyer belt to the dispenser. A little scanner reads your label and triggers the precise amount of varied pigments and toner to be dispensed into your bottle, down to a single drop. In fact, Polly is capable of dispensing over 2.2 octooctogintillion pigment variations (yup, that's a real number), all drawing from vats of color that have been custom formulated by our experts right here, on site. Each pigment dispensed is actually measured by weight (instead of volume like most places) on a high-grade medical scale (because we’re fancy). 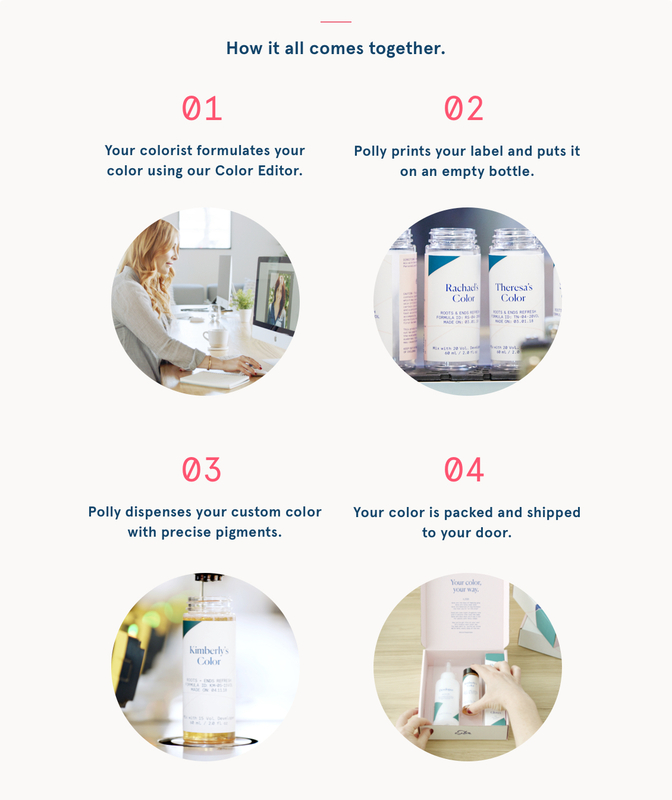 Then, your bottle is capped, packaged, and sent to its home—or apartment, or office, or wherever your hair desires. A different kind of machine. Polly may move each bottle effortlessly and with ease, but it’s actually a very complex machine. To create it, we had to push the boundaries of manufacturing. Most industrial machines are made to produce just a few colors in high volumes. That’s why most color companies offer a range of 15-30 premade, premixed shades. But Polly is faced with the challenge of making each bottle from scratch, every single time, almost like a printer. Prior to Polly, we couldn’t find machinery that could pull something that bold off, so we designed the machine ourselves from the bottom up. From the labeler, to the bottle capper, to the pipes that distribute exact amounts of color, we mean it when we say there’s nothing else like Polly Chrome. 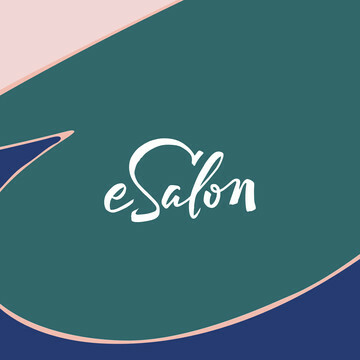 What if you can get custom hair color, dispensed from scratch right before your eyes? Well, now you can. We took our 50 ft industrial-sized machine and compressed it into a compact frame no bigger than your average ATM. What does this enable us to do? Bypass shipping times and allow our clients to have their custom color dispensed on the spot. And a smaller machine does not mean less color options—our compact Pollys are still capable of manufacturing with the same 1/10th-of-a-gram precision and replicability as our big machine at our HQ. Servicing our Color Studio and Color Takeout experiences, the compact magic-maker opens new doors for clients to have their color crafted on demand—making the possibilities truly endless.